A cross-section of city and hospital officials, and healthcare industry, community and business leaders joined in celebrating the grand opening of Promise Hospital of Phoenix’s newly relocated long-term acute care (LTAC) hospital on the north side of the Arizona Regional Medical Center Campus (ARMC) at 433 E. 6th Street, Mesa, Arizona. The ribbon-cutting ceremony officiated by hospital executives with Mesa Mayor Scott Smith and Council Member Dave Richins was followed by the first tours of the 30,000-square-foot, two-floor, 37-room, 48-bed hospital in a hospital (HIH) facility. According to Promise Hospital CEO Scott Floden and City officials, the hospital’s relocation is estimated to generate substantial direct and indirect economic impact to Mesa, its Downtown and surrounding communities through staff and facility purchases, in addition to the creation of 150 new skilled jobs and major capital improvements made to the facility. In his remarks, Floden noted that the reasons for Promise’s decision to relocate from its former location in Downtown Phoenix was four-fold: 1) expand scope of much-needed specialized LTAC hospital services in the East Valley, 2) increase on-site diagnostic and treatment services to Promise patients, 3) to better align services with our key physicians, and 4) continue to grow and support the critical role an LTAC hospital plays in a quality-focused continuum of healthcare in the area. 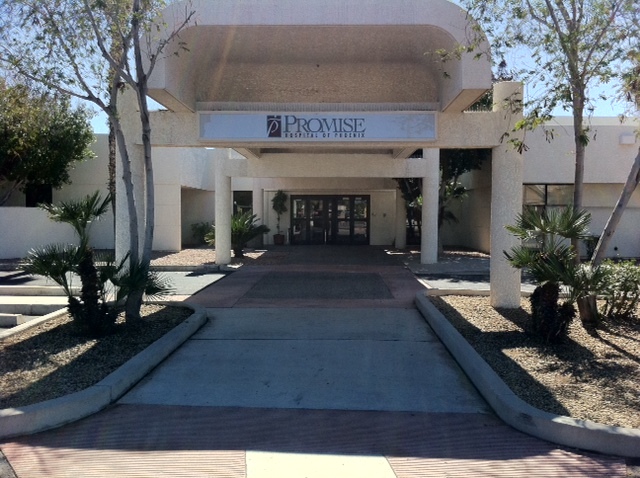 Featuring its own dedicated entrance and reception area, Promise Hospital invested significant capital to improve, redesign and equip the facility to best serve the physicians and their patients living and working in Mesa and its surrounding communities of Chandler, Gilbert, Tempe, Scottsdale, Glendale, Avondale, Sun City, Peoria, Paradise Valley, and Queen Creek. As noted during the ribbon-cutting ceremony, the hospital’s relocation exemplifies the positive community healthcare and economic development impact, benefits and advantages of Mayor Smith’s “H.E.A.T.” economic development initiative (http://www.mesaaz.gov/economic/HEATSummary.aspx) and support efforts for Downtown Mesa revitalization. The efforts are guided by Mesa’s industries of opportunity: Healthcare, Education, Aerospace, and Tourism. Based on Mesa’s strengths, quality infrastructure, talented workforce, projected growth and global market trends, the City of Mesa is already realizing significant benefit in each industry space, with Promise Hospital’s presence enhancing its healthcare asset. Promise Hospital of Phoenix specializes in high acuity long-term hospital care for patients suffering from the most complex of medical conditions. The hospital’s distinctive LTAC environment provides acute medical care and aggressive therapy services for patients with unresolved, acute, or catastrophic illnesses, as well as multi-organ disease processes who require an average length of stay of 25 days or more. Promise specializes in acute respiratory/pulmonary care (including ventilator management and weaning), infectious disease management (including long-term IV antibiotics), advanced wound management, complex medical management, and treatment for multi-organ failure and post-surgical complications. The hospital’s “quality” scores consistently outperform national averages, especially for its successful ventilator weaning program. The 48-bed facility features 24 private rooms and 12 semi-private rooms with 23 telemetry beds; 15 med/surg beds; a six-bed Intensive Care Unit (ICU), a four-bed High Observation Unit, three isolation rooms, all featuring in-room cameras. Also onsite there is a dialysis suite, wound care suite, rehab/physical therapy gym, pharmacy, physician conference and break room, and administrative offices. The rehab/physical therapy area includes an activity room equipped with full kitchen set up, washer and dryer, and other appliances specifically designed for therapists to help patients enhance their independence level by training them on cooking, personal hygiene, grooming, and other activities of daily living. All nursing staff is ACLS certified using a primary RN nursing model for all patients and adherence to strict compliance of benchmark patient safety measures with a 2 to 1 patient to nurse ratio in its I.C.U. So that patients do not have to be transported off-site for medical tests, therapies, or surgical procedures during their stay, Promise Hospital’s on-site services at the new location include MRI services, CT scans, Ultrasound, Echocardiograms, PEG tube placement, G/J tube placement, EGD/colonoscopy, esophageal dilatation, PICC line placement, central lines placement including Mediports, Groshongs, EEG, modified barium swallows, interventional radiology with C-arm, , nerve stimulation, bronchoscopy, tracheostomy, hemodialysis, catheter placement, Doppler studies, paracentesis, sharp debridement, and thoracentesis. Additional benefits of being an HIH with Arizona Regional Medical Center include access to a working helipad for outlier transport to Promise Hospital, and ARMC’s in-house Emergency Department with 24/7 physician coverage which were not available at Promise Hospital’s previous location. For more information, admissions, and physician referrals and affiliation, contact Luis Gonzalez, Promise Hospital of Phoenix Director of Physician Relations at (480) 427-3000, ext. 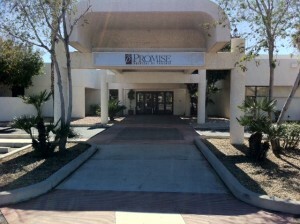 3005, cell (602) 819-1461, lgonzalez@promisehealthcare.com or visit http://www.promise-phoenix.com. For employment opportunities, contact Promise Hospital Human Resources Director Christie Brea at (480) 427-3000, ext. 3003 or cbrea@promisehealthcare.com.